NRG Oil Catch Can UNIVERSAL - Pann Auto Performance - San Diego largest aftermarket automotive performance parts - What do you drive? The NRG Oil Catch Can is installed connecting the PCV Valve or pressure release hose to the intake pipe, this unit captures and stores excess oil coming from valve cover. This results in clean air recirculating back into the intake unlike the factory system which puts the release tube directly back into the engine. Results a decrease in valve cover pressure prolonging engine life and increasing performance. 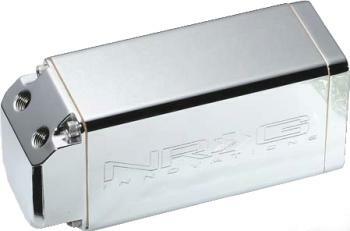 The NRG Oil Catch Can is a must in any competition car due to regulations concerning oil on the track.